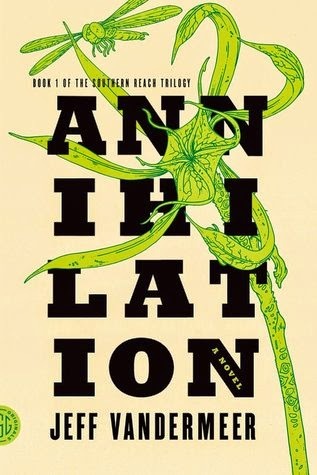 I really had no idea what to expect going into Jeff VanderMeer's Annihilation. I'd seen it on our New Book shelving units at the library, and wondered about it. Such a small book. Paperback. 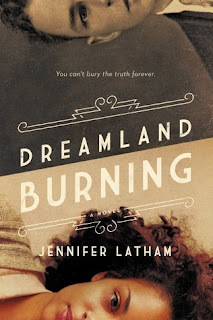 But the cover was eye-catching (what can I say--typography!) and it rested, quiescent, in the back of my brain. 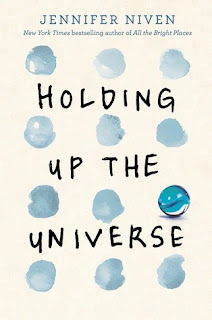 Then Goodreads did their annual brouhaha, AKA the Goodreads Choice Awards, and this popped up on the sci-fi lists. I was woefully underread on the sci-fi books, so I attempted to remedy that by putting a bunch of them on hold at the library. This weekend, I got the flu. The actual influenza flu, not that horrible gastroenteritis thing that in vernacular English, we also call the flu. This means that many of my friends were perplexed and even a bit revolted by my weird cravings for junk food (pizza, burgers). Since my main occupation was lying in bed all day, punctuated with exciting moments of rolling over to my couch, I was too tired to cook, and hence, got really, really, really hungry. This has nothing to do with anything, but you see how I was so completely out of it. I could barely pay attention to a book because I was too busy wishing I could die and simultaneously plotting to convince someone to bring me a gluten-free pizza. All of the books on my bookshelf looked too long and too wordy for me. I saw Annihilation sitting there and thought, "Oh goody! Sci-fi/horror in a small package! I can do this." I'm not sure if reading this while exceedingly feverish intensified the whole effect or distracted me from the beautiful danger of it, but either way: wow. This is a book that people will either love or hate. There's really no middle ground here. It's got an unreliable narrator, a mysteriously deadly Eden, and conspiracies galore. I adored it. The Biologist serves as our narrator for this expedition into Area X. It's the 12th expedition. Its members know the risks: many expeditions simply vanished, while others never completed their mission and the members simply ... reappeared back in the "real world," with no memory of crossing the border out of Area X. The Biologist really doesn't care. She's extremely introverted, preferring to observe ecosystems for years on end than to interact with other humans. There's nothing left for her on the outside--her marriage was failing, she had no real friends, her mother was a drug addict and her father a con man. At times, the Biologist's narrative is so brutally honest that it stings. One wonders if she is capable of love or empathy, or if this, too, is a façade put up for the reader. After discovering the Tower, what little sense of camaraderie between the women dissipates with deadly speed. Soon, we only have the viewpoint of the Biologist and her discoveries, which increase in weirdness. So much is packed into this little tome that I can't cover it all; and to do so would be to ruin the slightly delusional experience of reading it. In the end, the reader leaves Area X with little more understanding of it than when she entered, but with so many questions. This is a book that is not meant to satisfy, like a Snickers. It's meant to provoke and irritate and make you think. I don't expect the rest of the trilogy to tie everything up in a nice little bow--in fact, if that happens, I'll be rather disappointed. VanderMeer's prose is eloquent and sure, and his characters unlikeable in their stripped-down humanity (which happens to be just the way I like my characters! ).